You can all this here, no more using multiples online services, or taking technical help, or paying big money for simple web presence services. D. Service businesses: Doctors, Salons, consultants, etc. 1. If you are a new business (or, haven't made a website yet), Truho gives you all you need to create an effective online presence. - Depending upon the things your business sells: List your products/services/events. - Now start promoting your business: Share your offers/deals/rewards. Just use the dashboard. - Using your Truho dashboard (you can always access it from the 'gears' icon on top right), track your Truho activity: Important stats, sales, transactions, followers of your Truho page, feedback, disputes raised by your customers, and more. 2. If you are an established business, with your own website, and presence on other important outposts on the internet, remember that Truho gives you the only place to share the best things about your business - your marketing campaigns, your best messages for your customers. - Share your offers / deals on Truho Offers Network. Go straight to the dashboard, click on 'offers', and start sharing exciting deals. Soon you will start get a following for your business page on Truho, where people are following you just for the deals! Pro tip: The best way to have more people following your business on Truho, is to share offers and deals on a regular basis. More offers get more followers. More followers get you more business. - Post your job openings in Truho Jobs. 3. Know whether people love your business/brand well enough to recommend it to others. Truho has this nifty NPS ('Net Promoter Score') poll tool, which you can use to gauge people's preference and love for your brand. See an example here. You don't have to do anything. Just share the link with your customers on all your online outposts. (The link is on your Truho home page). Bills, Store Mode, and Payments. We are butting heads with the payment gateways for these services. A very basic version is already live in the 'store setting' tab on the 'basic setup' link in your Truho dashboard ('gears' icon on top). - Data downloading: You don't want a centralized entity to own all your data. Already, Truho gives you the tools to download your data. How to do this: From the 'gears' icon on top, click on 'download your data'. 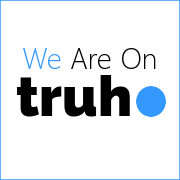 Review businesses, products, services and events listed on Truho. Like businesses, products, services and events listed on Truho. Follow businesses you like to see more deals from. Truho is different. We just want you to be awesome.